Brian Griffin comes back from the dead. Fans of the animated TV show were left distraught last month after the beloved canine, voiced by the show's creator Seth MacFarlane, was killed off in a car accident, but the intellectual pooch was resurrected in the Christmas special, 'Christmas Guy', which aired in the US last night after Stewie, also voiced by Seth, came up with a time travel plan to save his friend. Brian's death had sparked much protest online with 150,000 people signing a petition demanding he be brought back. In the special, Stewie goes to the mall with the Griffin family's new pet mutt Vinnie - voiced by Tony Sirico - and asks Santa for his best friend back, but when that doesn't work he remembers he has a time travel machine in his rucksack and he uses it to go back to the moment just before Brian is tragically killed. He says: "You're alive my friend! I couldn't live without you so I came back from the future to save your life." Brian replies: "Thank you for saving my life. A lot of other families would have just gotten another dog and moved on." 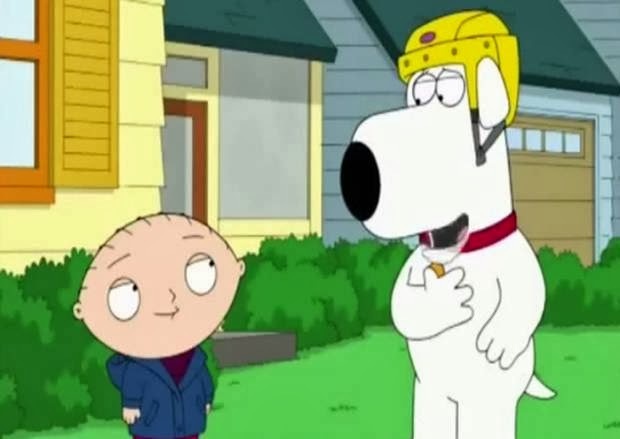 After the episode aired, 'Family Guy' creator Seth, took to Twitter to tell his fans that they would have been "f****ing high" to think they'd killed off Brian for good. He wrote: "Oh and hey ... thanks for caring so much about the canine Griffin. He is overcome with gratitude. "I mean, you didn't really think we'd kill off Brian, did you? Jesus, we'd have to be f***ing high. "And thus endeth our warm, fuzzy holiday lesson: Never take those you love for granted, for they can be gone in a flash."